Rahul Dravid: Rohit Sharma a future "Rahul Dravid" ? Never! Rohit Sharma a future "Rahul Dravid" ? Never! Now Rohit Sharma has suddenly become popular.He is playing well(!) in Commonwealth bank series.He has scored 139 runs in 5 matches with average of 46.33.The average looks quite good.But the way he played was horrible.In every innings,he 'played and missed' several times, tried to follow the delieveries far outside the offstump, tried to go for huge hits at improper time and much more.Though he looked better than others (except Gautam Gambhir) he was not looking mature.He has got a good technique but he lacks patience. The biggest joke is that he is being called as "future Dravid"! 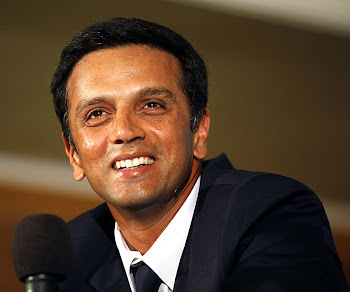 -Dravid always played with responsibility.He never tried to go for big shots when the situation was against it.Dravid has superb technique and most important, he has PATIENCE.He never created chaotic situations when he was unable to score for 10-15 delieveries. Sharma is at the start of his career.So it would not be correct to compare him with a player like Rahul Dravid. when people or should I say..
Rohit Sharma gonna be "LIKE" Rahul Dravid.. The ain't COMPARING..
What do you mean by "LIKE" Dravid? 1.Does it mean that he plays the role of Dravid in Team India? 2.Or does it mean that he has similar technique,style of playing as that of Dravid? If you mean 1st statement,I think there are better options than Sharma like Gambhir,(even Dhoni is playing with responsibility).Rohit Sharma lacks Patience. If you mean 2nd statement,Sharma is nowhere near Dravid.Dravid has superb technique. I agree that Dravid had not got the best start in his ODI career,but he never kept aside his batting style and technique.